An example of what Facebook's Amber Alerts will look like. 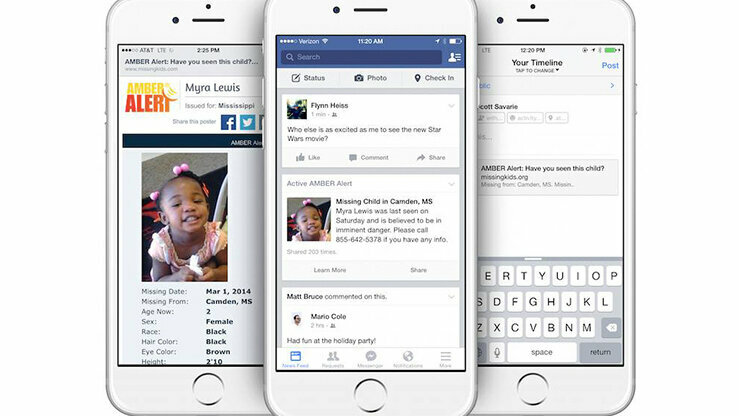 The National Center for Missing and Exploited Children will begin sending out Amber Alerts on Facebook's news feed. The alerts will include a photograph of the missing child and the location where the possible abduction took place. Facebook has 185 million users in the U.S., and the notices will be tailored to location — so users will receive alerts about missing children in their area. Emily Vacher is Facebook's trust and safety manager, and helped put together the Amber Alert collaboration. She tells NPR that Facebook has helped bring children back home in the past. "We were actually really inspired by people who already use Facebook for this purpose," Vacher says. "We've noticed over the last couple of years that when kids go missing, people started posting about this on their Facebook pages to share information within their own communities. And we saw a lot of successes out of this. Kids have actually been brought home because of the information people shared on Facebook." "Amber" stands for "America's Missing: Broadcast Emergency Response." The alerts arose from the 1996 abduction and murder of Amber Hagerman, 9, in Arlington, Texas. So far, the alerts have helped save 728 children, according to the National Center for Missing and Exploited Children. "Amber Alerts are very rare occurrences," Vacher says. "So when you see one of these on Facebook, take a couple of minutes to read the alert, to share the information with your friends and family, and just pay attention to your surroundings, because a tip that you may find may actually result in reuniting a child with their family." Amber Alerts already ring on cellphones and flash on highway billboards and TV and radio broadcasts, but Facebook is the first social media site to work with the National Center for Missing and Exploited Children. Bob Hoever, director of special programs for the center, says what makes the Facebook program different from TV and radio is the sharing aspect. "The unique ability that Facebook provides us," Hoever says, "is the opportunity for those people that see the news feed to share that with their friends, and to spread the word as quickly as possible to have as many people as possible out there searching for the child." this is one thing i'm ok with since it's for finding people. only thing i hate about it being on the celly is the terrible noise that comes from your phone.